I've had this block stuck in my head for a long time and finally decided to bring it to life. 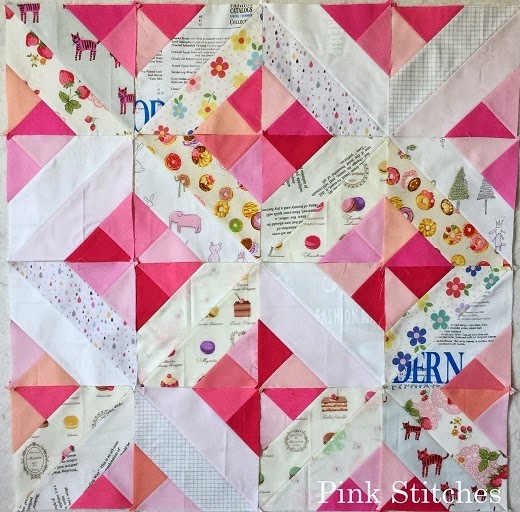 This block takes quite a bit of trimming but the end result is worth it. 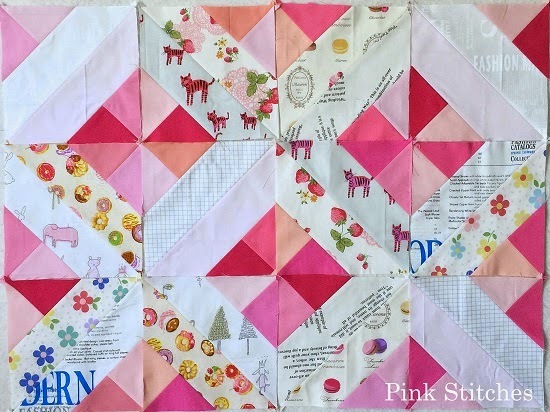 The finished block size is 6.5" but I will try to come back later and post a size chart for larger blocks. If you make this block, use #partingwaysblock on Instagram so I can see! 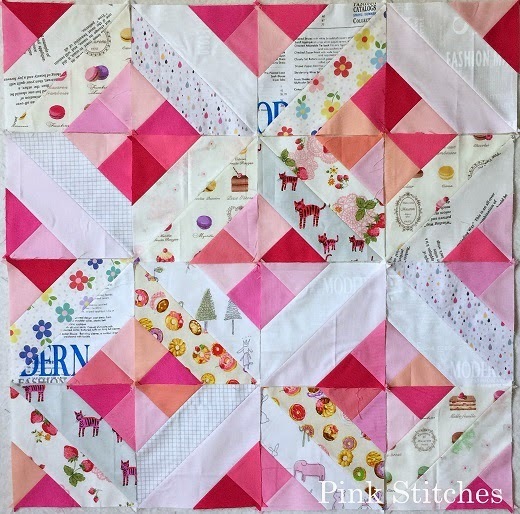 The cool thing about this block is that you can mess around with it and create different layouts. 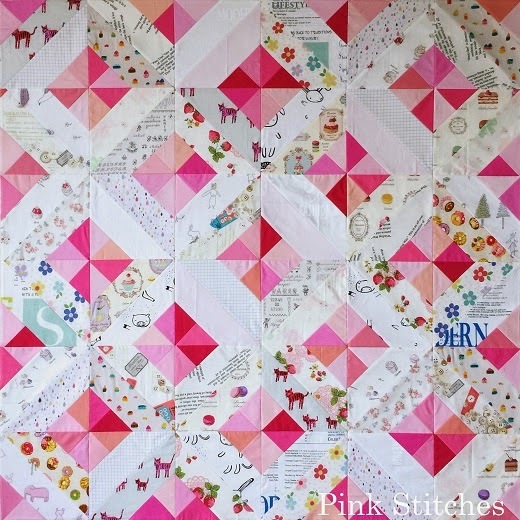 I settled on the "kaleidoscope" effect for the pink quilt that I made. 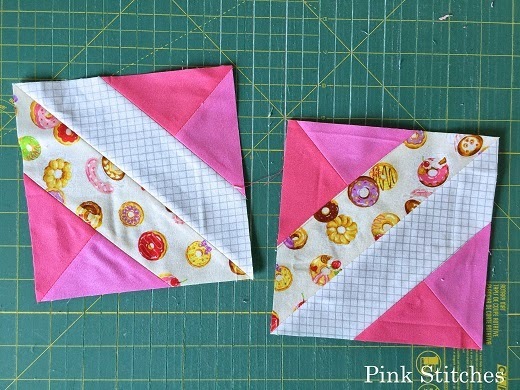 First, you'll need to draw a diagonal line across the smaller squares to create your HSTs. 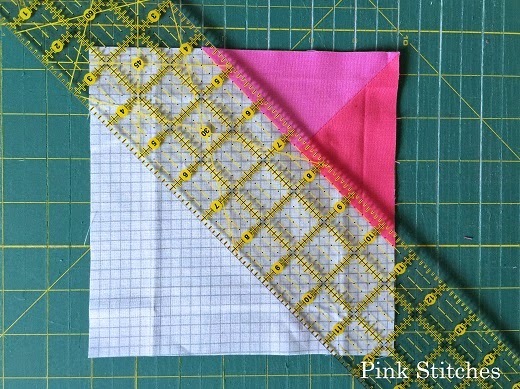 Stack both 5" squares on top of each other, right sides together, and sew at 1/4" on each side of the penciled line. Slice in half along the diagonal line you drew. 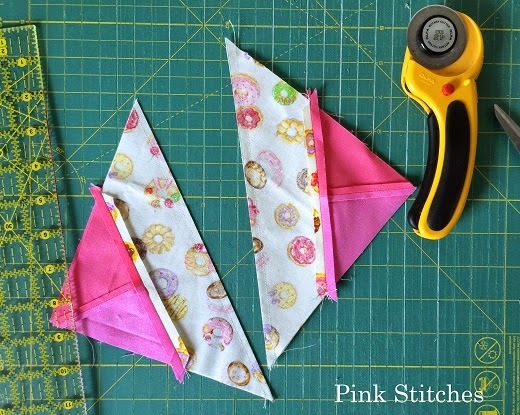 Press open and trim at 4.5"
Now slice each of your HSTs diagonally, perpendicular to the line you have sewn. Place one of the halves on a corner of the larger 7" square, right side up. Line up your ruler to 1/4" over your corner. 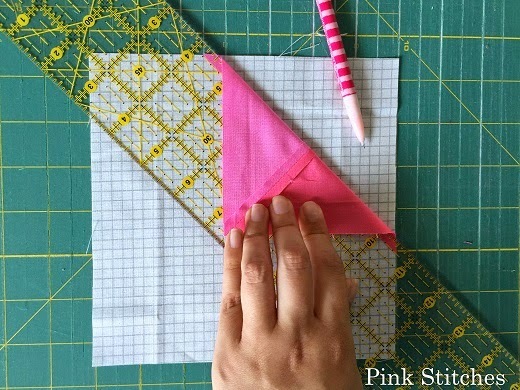 Holding the ruler down, fold over your corner and mark a line along the ruler's edge on your 7" square. 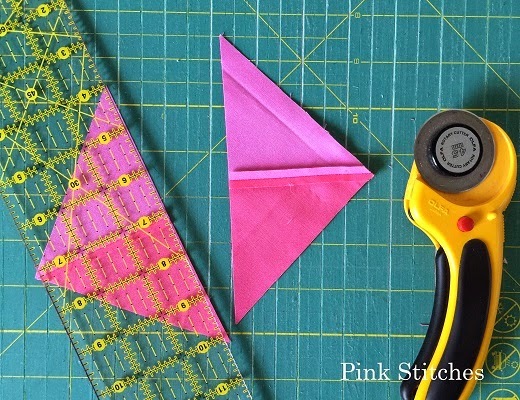 Now draw a line onto your corner 1/4" from the long edge. Place the corner on top of the 7" square, wrong side up, making sure to line up the two lines you drew. Pin in place. 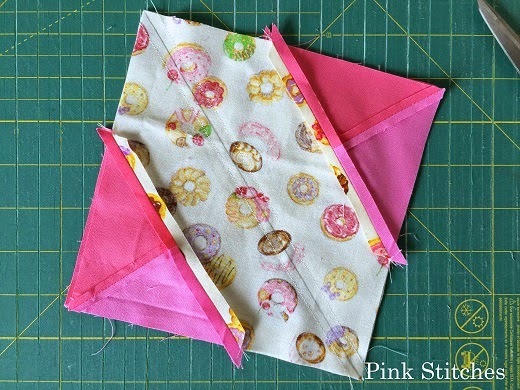 Trim off the excess corner of the 7" square and then sew down the line you drew. You should be left with a 1/4" seam. 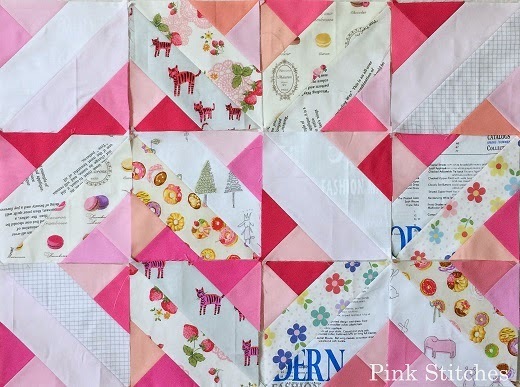 Repeat with other corner and both corners of remaining 7" square. Press seams open and square off to 7". 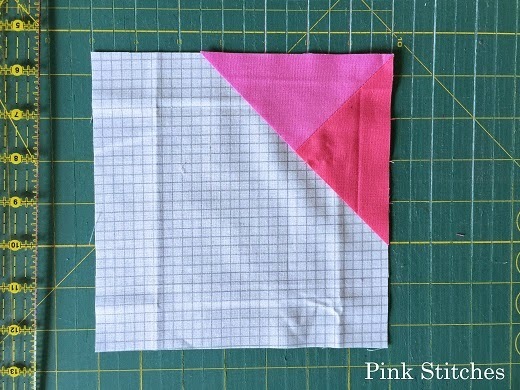 Draw a line diagonally on the wrong side of one of your squares. 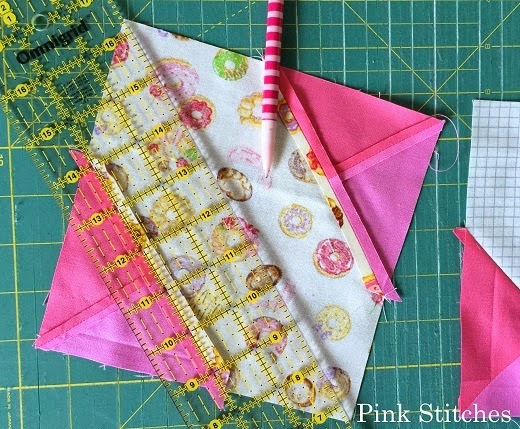 Stack your two 7" squares, right sides together, and sew at 1/4" on each side of the penciled line. Press seams open and trim finished square at 6.5". 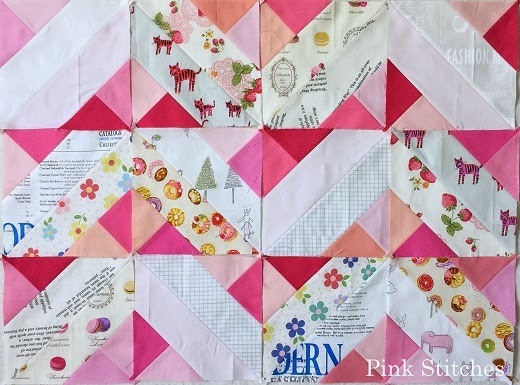 Beautiful quilt, thank you for the instructions on making the blocks.